Hampton Glen Community in Jacksonville, Florida. Hampton Glen is conveniently located off East Baymeadows Road in Southside near Jacksonville's popular Deerwood Park business district. This 400-home country club community features a full array of recreational amenities and is Jacksonville's top-selling community in its class. Hampton Glen offers a quiet sanctuary from city pressures, while affording quick access to the area's most desirable shopping, dining and recreational amenities. 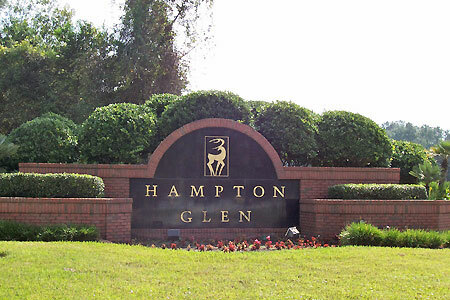 Residents of Hampton Glen are just minutes from Jacksonville's best shopping, dining and entertainment areas. Hampton Glen offers an array of amenities for you and your family. The neighborhood includes a clubhouse area that overlooks the community's adult and kid pools. Barbecue grills are poolside for friendly cookouts. Tennis courts, basketball courts, soccer fields, and kids jungle gym area are available for your enjoyment. Call today at (904) 307-8998 for your personal tour at Hampton Glen.